Shadowrun: Hong Kong Kickstarter Now LIVE! A Preview of Our New Setting: Coming to Kickstarter in January 2015! Here's a piece of look & feel concept art for our new setting. We'll show how it translates into Shadowrun's isometric gameplay view when our Kickstarter launches in January! Shadowrun: Dragonfall - Director's Cut // Help Promote Us on Steam! Shadowrun: Dragonfall - Director’s Cut is LIVE!!! Shadowrun: Dragonfall - Director’s Cut (our bigger, better and STAND ALONE release of Dragonfall) is now available! Shadowrun: Dragonfall - Director’s Cut // Dev Diary #2: New Music! Hi guys! Mike here again. I’m excited to share with you our official trailer for Shadowrun: Dragonfall - Director’s Cut*. Check it out! Shadowrun: Dragonfall - Director’s Cut Details + Screenshots from GenCon! Shadowrun Returns Version 1.1.1 Released - Includes French, Spanish and Italian! 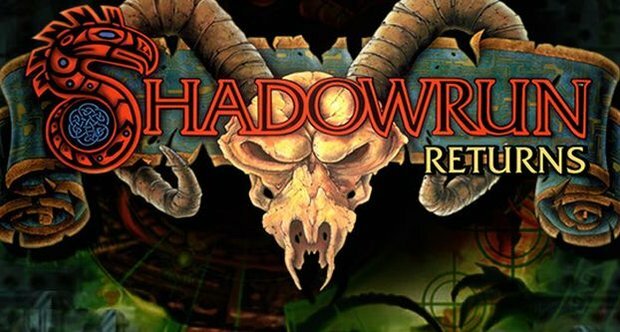 DRM-Free Shadowrun Returns Now Available To All! HBS is happy to announce that as of today, Shadowrun Returns is now available for Windows and Mac on GOG.com! Patch 1.1 and Linux now in Beta! Things are moving quickly here so we thought we’d quickly update you on what’s going on. What’s Happening and What’s Next? 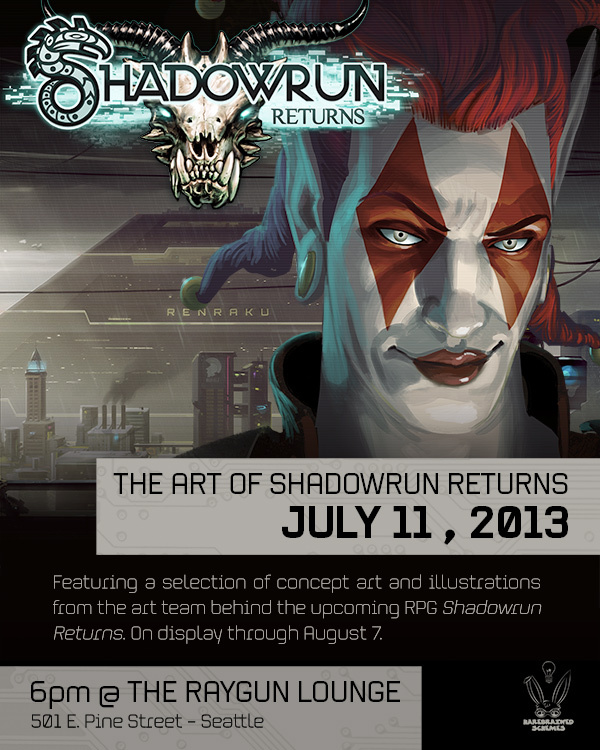 Here it is: The Official Release Date for Shadowrun Returns is July 25, 2013. The Word of the Day is. . . Information! Even More Late Breaking News! 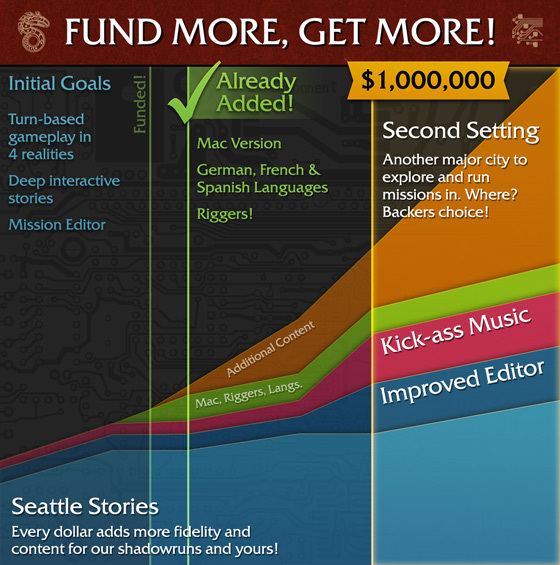 Want To Upgrade Your Backer Level? We are incredibly excited and humbled by the great response to the First Look Video we released this morning. Thank you all so very much! Okay, the wait is over! Here’s what we’ve been up to for the last nine or ten months. Happy New Year of Shadowrun! Hey there, everyone! Happy Awakening Day! It’s Thanksgiving time at Harebrained Schemes, and guess what we’re thankful for? Post-PAX Post: Our First In-game Assets Revealed! Fluff and Smoke Part V Now Available! If you like Shadowrun . . .
After popular demand, we're releasing this beautiful wallpaper. Feast your eyes, friends! Guess what I managed to snag from our art team? 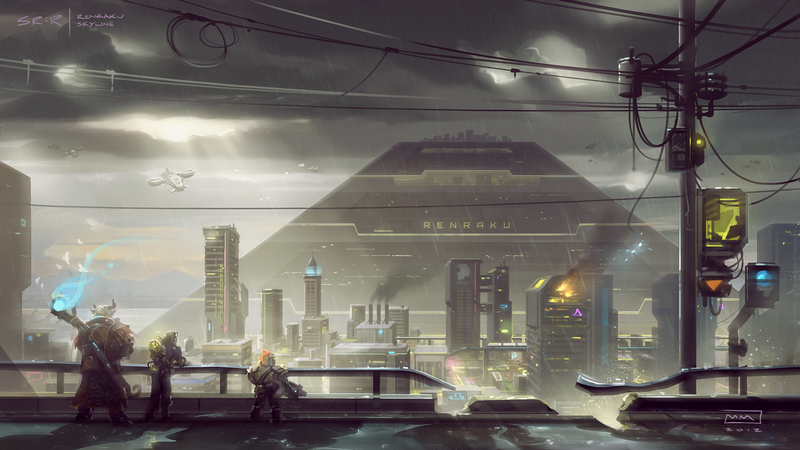 Oh, you know, just some concept art for Shadowrun Returns. . .
Shadowrun Returns Q&A with Jordan Weisman and Mitch Gitelman! Almost the minute our Second City Backer's Survey went out, we began receiving responses. Within the first 2 minutes, we hit almost 500 votes! "We really shook the pillars of heaven, didn't we Wang?" Including PayPal, our final total is $1,895,772!!! We are so happy to be associated with such a wonderful community. You did it! $1.5 million dollars! Phenomenal!!! And do we have one little stretch goal left? You bet! And it was your idea. We didn’t expect to be posting this so soon! And it's sunny in Seattle! Our heartfelt thanks go out to you. 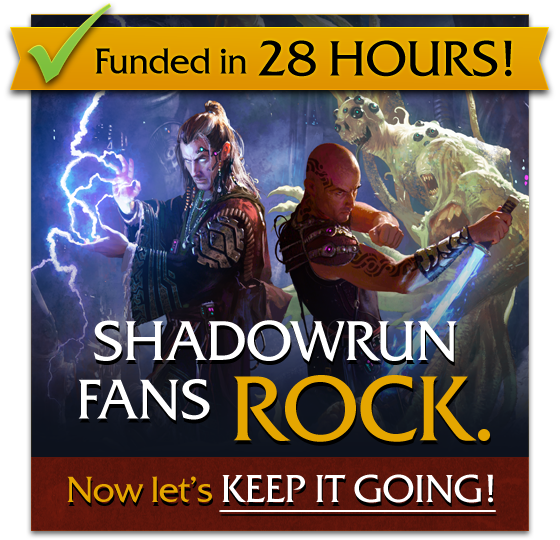 A very deep and sincere THANK YOU to everyone who has contributed to Shadowrun Returns so far. This has made for an interesting day, to be sure.